Halos Turquoise Animal Friends SleepSack promotes safe and comfortable sleep for baby! The Halo SleepSack wearable blanket replaces loose blankets in the crib that can cover your baby's face and interfere with breathing. In addition to sleeping safer, it helps babies sleep better, too. It's a warm cuddly blanket they can't kick off; ensuring baby sleeps soundly throughout the night. 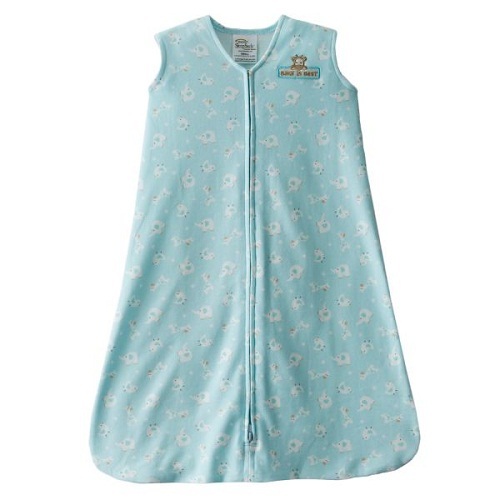 Used in hospitals nationwide, the Halo SleepSack wearable blanket is the #1 choice of hospitals and it the only product that carries the gold seals from leading SIDS and safety organizations. Small- 23" to 26"- 10 to 18 lbs. Medium- 26 "to 30"- 16 to 24 lbs. Large- 30" to 35"- 22 to 28 lbs.